SAN DIEGO (NEWS 8) — For the sixth year, Yelp has released a list of the top eateries in the U.S. based on the crowd-sourced reviews on their website and app. Making the cut of “must try” restaurants of 2019 are six local locations. From East County to North County and everywhere in between, these restaurants represent America’s Finest City well with diverse cuisine including a taco shop, a New Orleans-style bistro, a Vietnamese Pho restaurant and more. According to Yelp's website, their methodology in determining their top 100 consisted of "reviews received by businesses in the restaurant and food categories." The review site also "considered both the rating and the volume of the reviews, while accounting for the overall volume of reviews in each business’s area so as not to disadvantage businesses in areas with relatively low review volume." 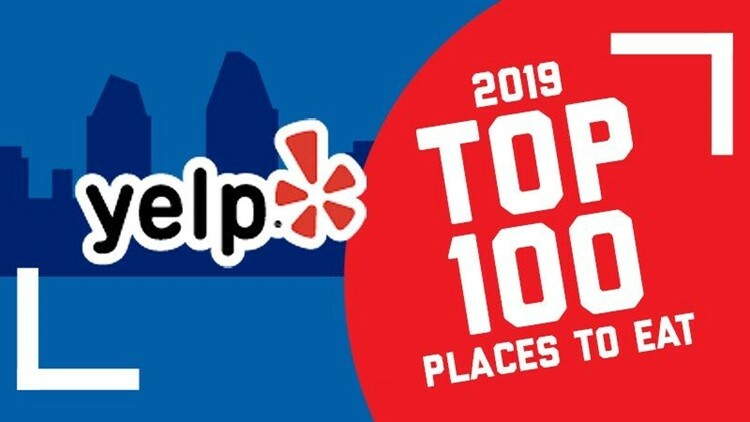 See below for details on each of the San Diego spots that made Yelp’s "Top 100 Places to Eat in the US 2019’ list." Coming in at #17 is Crafted Greens in El Cajon. The “fresh and organic eatery” has a menu that includes ingredients sourced from local farms. Along with several salads (or “greens”) they offer sandwiches, flatbreads and more. The health-conscious restaurant has five stars on Yelp with over 300 reviews. Chuy’s Taco Shop on El Cajon Boulevard in Rolando ranked #29 on Yelp’s list. The taco shop has all the typical fast food Mexican fare and offers daily specials. Chuy’s carne asada fries and options at the salsa bar get high marks according to reviews. The eatery has five stars on Yelp with just under 300 reviews. #69 on Yelp’s list is Tahini in Kearny Mesa. The restaurant serves “authentic Middle Eastern street food.” Their simple step-by-step menu offers pitas, bowls and salads with ingredients of the diner’s choice along with several sides - including the Halloumi cheese stix which have gotten rave reviews. The eatery has five stars on Yelp with over 400 reviews. Bud & Rob’s New Orleans Bistro in the East Village area of Downtown San Diego earned the #72 spot on the list. Their menu boasts Cajun and creole dishes including gumbo, jambalaya, red beans and rice, catfish, and crawfish etouffee. Several Po Boy sandwich options have garnered praise from reviewers. This spot has five stars on Yelp based on about 350 reviews. Just a few spots down the list is Pho Guys in Vista at #75. In addition to the various types of the Vietnamese soup Pho, they also serve several specialty entrees and appetizers. Their egg rolls received high marks from patrons according to their reviews. This location has five stars on Yelp with over 300 reviews. Also making the cut at #94 is Empanada Kitchen in Downtown San Diego. Their menu boasts several varieties of empanadas, of course, which can be purchased a la carte, as a meal with two or three selections, or as a party pack of 24. In addition to loving the food, reviewers were full of praise for the restaurant’s customer service. They have five stars on Yelp with over 150 reviews. Are you drooling yet? Happy eating in 2019, San Diego! Click here to see Yelp's full list.